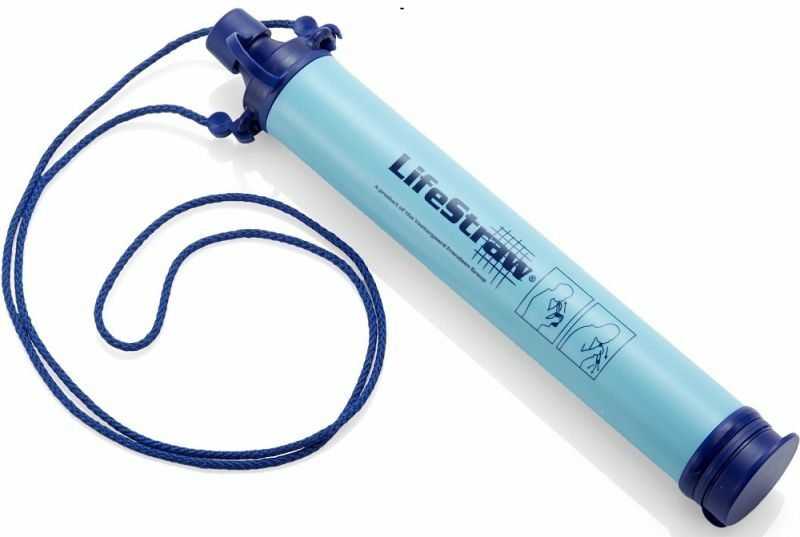 One of the best innovative ideas we have seen is the LifeStraw. This is a fibre membrane which is hollow. Instead of chemicals such as iodine or chlorine, water travels through narrow fibres when it is sucked at high pressure. The fibres then trap the protozoa, bacteria and other pollutants. These pollutants then are flushed out of the straw by backwashing. It removes 99% of waterborne bacteria, such as the dreaded E.Coll; as well as 99% protozoa parasites, and Typhoid fever, Dysentery and Hepatitis E causing bacteria. Mud and other pollutants are reduced to 0.2 microns3. Sounds absolutely fantastic, especially for poor countries and travelers travelling to countries where water may be unhygienic. Innovative ideas such as this one are to be applauded and supported; as they can contribute a great deal to improve the health of economically weaker section of society. Dancing vigorously may have a good use after all. You may lose some calories but your phone can get some energy, which is the idea behind this gadget. Orange, the UK based cell phone and internet service provider has developed some prototype armbands to charge mobiles. Eco green products like this one are great as concepts, and sometimes become quite the rage among youngsters. This tent folds up, collects rainwater and solar power. 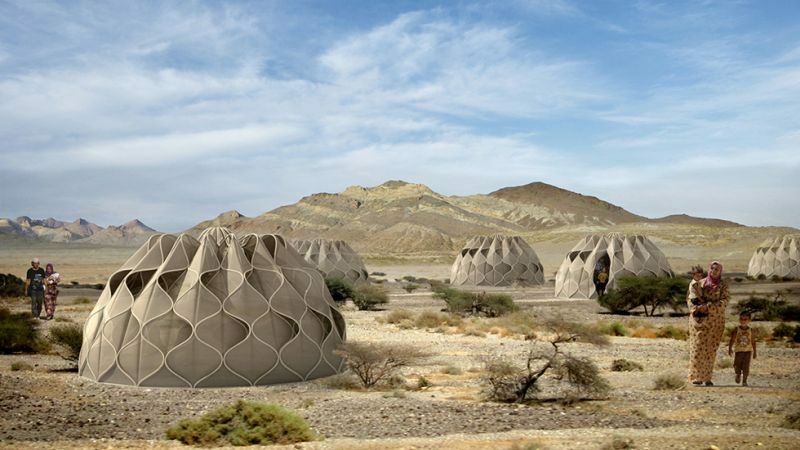 This awesome tent was designed by Jordanian artist Abeer Seikaly, keeping in mind refugees displaced by war, climatic conditions etc. The most eco friendly shavers are razors; some guys can’t do without their electric shavers. Keeping such people in mind the manufacturer has come up with an interesting solution. It is an example of simple innovative product ideas, has come up with a shaver, which just has to be winded up. This clock has been invented by one of those go green ideas, which belong to the category of truly innovative ideas. The clock actually runs on tap water and just a little lemon juice. It will run for about 14 weeks on one watery charge. 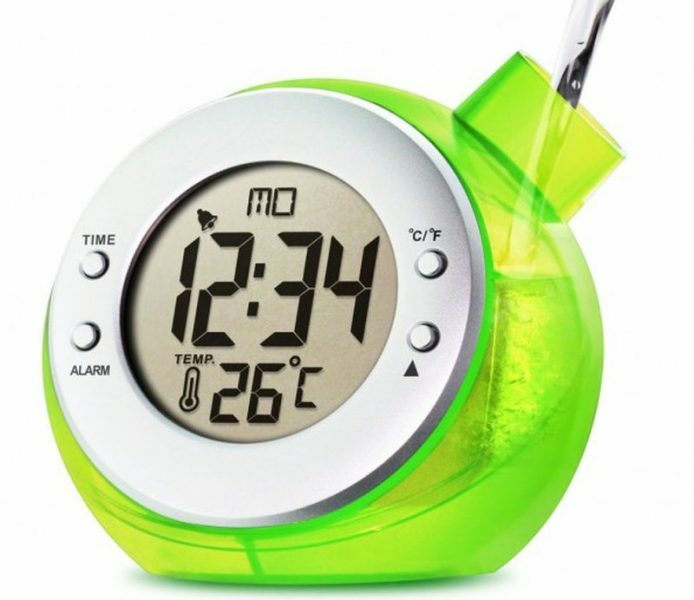 Finally, a clock which does not need any batteries to charge nor does it need any daily winding up. Just water it from time to time as you would water your plants! Why didn’t anybody think of this earlier, is the first thing that came to mind. This buscycle is certainly of the great innovative ideas which can change the face of public transportation in the future. Imagine this –instead of going to the gym, you volunteer to pedal the bus with other office goers. People can get their dose of vitamin D, keep fit and help others to get from point A to point B. Simple innovative product ideas like this lamp planter can turn an ordinary space into an extraordinary one. 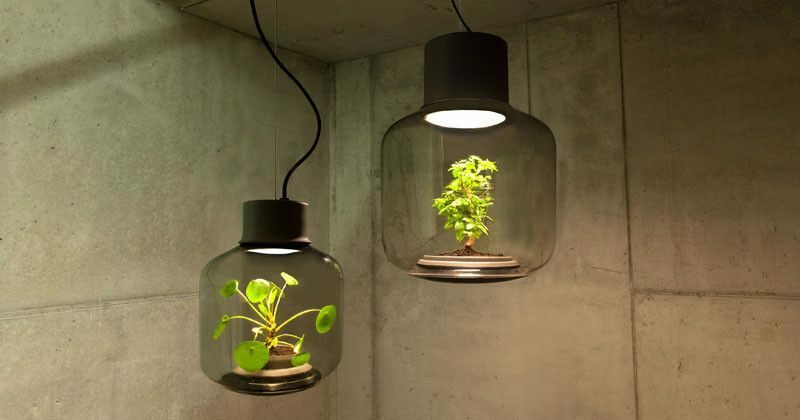 NUI Design Studio are the ones behind this lamp in which you can grow plants too. These lamps are innovative ideas for areas like basements or other windowless spaces, where it is usually difficult to have some real greenery. One of the eco green products, which we really like, is the NoPoPo battery. These batteries do not require toxic lithium to power them. Instead, all they need are any liquid (even sodas and sake would suffice!) and magnesium and carbon to generate power. This tiny little battery is one of those innovative ideas which might be the answer to toxic pollution caused by lithium batteries. Go green ideas are sometimes quite effective, but a little yucky! 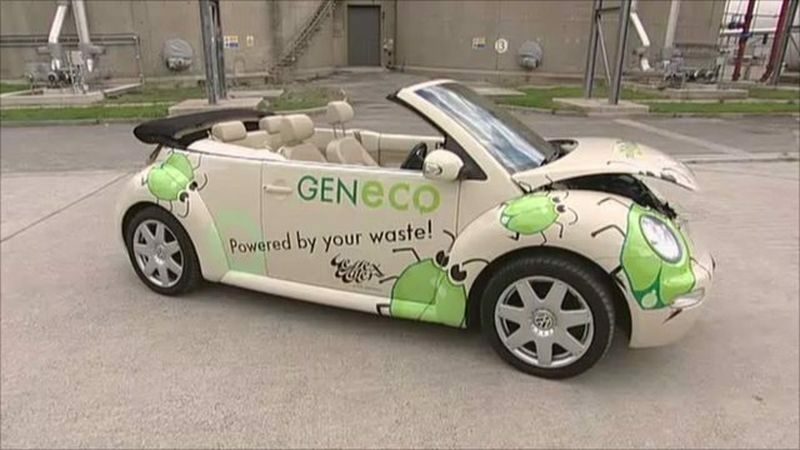 This smart VW Beetle you may see on UK streets is powered by poo, or rather biogas derived from breaking down organic matter like sewage or manure. It’s a great way to get rid of waste, and certainly, there will never be any shortage of the raw material, till the time we are on the planet! Talk about innovative ideas, and it can’t get any more innovative than this. The Pozzu shoe cream is made from healthy substances. You can even spread it on your toast. It’s doubtful whether anyone would go as far to do that, but it means that eco green products like this shoe cream is possible to manufacture and use, without causing any harm to the environment. 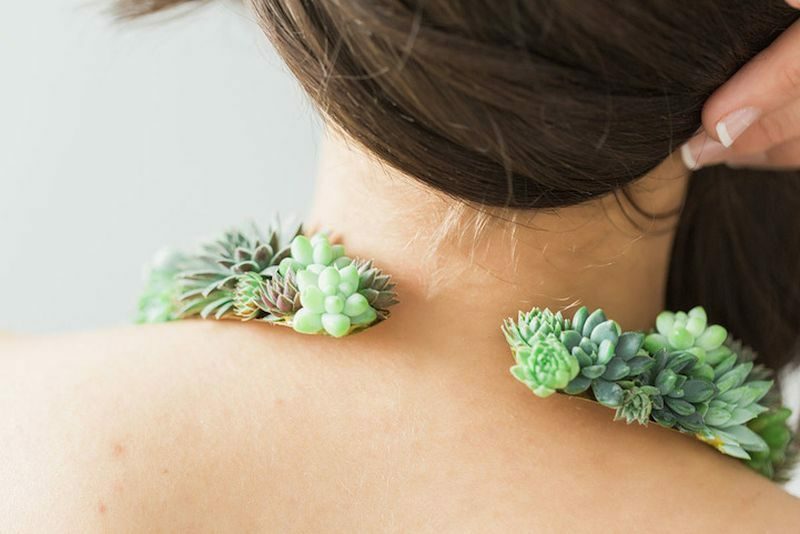 Eco green products like succulent jewelry are great for all women who follow a green lifestyle. These stunning living accessories can be used/worn for two months, and then they can be planted into pots to elongate their life. Elaborate necklaces, rings, bracelets and statement pieces are available at the designer Susan Mcleary’s Etsy store. A Filipino company called Ananas Anam; is doing the amazing work of transforming pineapple fibres into leather called Pinatex. This end product has been used to make eco green products like shoes, bags etc. 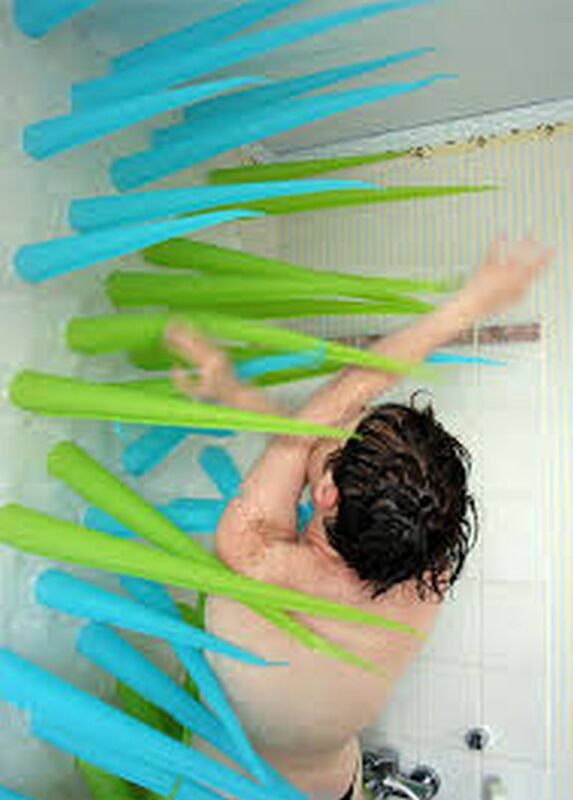 This water conserving shower curtain will literally push you out of the shower if you use more water than you need. According to the makers of this curtain is 4 minutes is all a person needs to have a shower. The sensors attached to the tap inflate the spikes with an air inflator! The humble toothbrush is not so humble any more. It has also gone green, and turned solar! One of the coolest innovative ideas we’ve come across, is the solar toothbrush. It doesn’t spin or vibrate or do anything fantastic. It just transforms light energy into negative ions which mixes with the saliva in the mouth. This, then breaks down molecular bonds by which plaque attaches to the teeth. A little complex, but hopefully it will work. Green scientists, designers and artists have put a lot of thought to create eco friendly products that will shape the future. Their unique innovative ideas will lead to a greener society, and reduce problems like global warming and climate change.